How Did She Get Here in the First Place? The logo of the English Language School we had in Greece for ten years – we are so proud of it and love it and always will! The idea for this blog post comes from a great friend and educator from Toronto, Canada – Tyson Seburn. Tyson is amazing, because either with his blog posts or tweets, he says something that makes me think and inspires me so much! Thanks Tyson. Tyson asked once in one of my replies to one of his posts that he would like to know more about my story at some point. I also spoke about it for a bit with Ken Wilson and James Taylor here in Zug. Here it is. As some of you may know from previous posts or Twitter, I was born in Toronto, Canada to Greek parents. Dad had a restaurant and mom stayed at home with us. When I was eight, they decided to move the whole family to Greece. It was not the easiest time of my life as school was very different to what we had experienced in Canada and some kids bullied my sister and me for our bad accents in Greek. Not so good for us back then. But things improved later on. After I finished school, I went to university and during my last year my eldest sister decided to expand her private lessons into a small school. We were so excited about it and a bit stressed too, as we started off with 23 students of Gina’s. Slowly but steadily, our small school took off and we rented more space, our youngest sister Christine joined as well and we ended up having thirteen more teachers, thirteen fantastic human beings and educators and 203 students of all ages, as each group had one to three people, which made our school unique at least in the Northwestern part of Greece were we lived. Our school got a number of awards for what we offered in education and we were so proud of it. We still are. We breathed, slept, ate and lived the school. The Loras English Academy was something we had created, something we loved so much and even went to on Sundays in our pyjamas (another plus was that it was 3 minutes on foot from our houses). Our beautiful school was running so well and we were enjoying it so much for ten years up until one day. My brother-in-law who is a financial analyst was offered a permanent position in Switzerland with the company he had been working as an external partner up until then, so Gina, Thomas and their two kids had to move. The school had to close as well as it would be difficult to keep running, as Gina was the managerial part of the team and our accountant said it would be the wisest thing to do. I cannot begin to describe the tumult of feelings, the sleepless nights and how much we cried over this decision, which we admit was the toughest of our lives and I truly hope it is the last time we have to make such a difficult decision. My next thought was, what do I do now? The school is not running anymore, what do I do? A huge and important part of my life was gone. First thought: go back to Canada. The truth is, I love Greece as my parents’ homeland, but apart from my work, nothing else kept me there. I decided against Canada as it would be really hard to see my family – we are all so attached. Second thought: Switzerland. Great educational system, my sister would also be there, but could possibly go wrong in an organised country like that? Apart from some difficulties and minor glitches you always have when you move to another country, I can say that I am now happy I came here. Work is going great, life is good, Switzerland is an amazing place, what more could I want? Yes, I remember, ever since I was a little girl, I was always looking for a better place. Yes I was hurt, a lot, that we moved from Canada. Yes, I was hurt, we were hurt, a lot, that we had to close down the school. But I guess that I have found a tiny part of that paradise I was looking for. I may not find a bigger part of it, but I will always be happy to have found even this part of it. Posted on September 30, 2011 March 12, 2013 by Vicky LorasPosted in 30 Goals, education, education reform, ELTChat, learning, life, teachingTagged 30 Goals Challenge, education, education reform, ELTchat, learning, life, special moments, students, teaching, What's Your Story?. Aw…beautiful. It’s always difficult when you have to end something good. But, it seems that things are picking up for you, and I’m happy to hear it! Now I know the answers to some of the questions I was going to ask in our interview! I don’t mind talking about it again : ) Now I feel much lighter (sorry I mentioned some of the answers ; ). Thanks so much for your support and encouragement! Ohhhhh ! I didn’t know this story! How sad you had to abandon your lovely school! Thanks for sharing it Vickouli mou! Thank you so much Marisa mou!!! I had avoided talking about it for a long time because every time I remember it, I become very emotional as do my sisters as well. I think now I feel much better having written about it. I know everything is going great here too, but it will always be a piece of our lives : ) I hope one day to visit your beautiful school! Thanks for sharing your feelings towards that great Academy you and your sisters had! It was a good step to share it so that you can realise your past has contributed to your professional and personal development. Although you had to quit that beautiful experience – it does not mean it will be forever! Who knows, sometimes life takes good things from us but the same life can give us back the same or twice!!! You and your sisters are great teachers , something that you all still share! 😉 So keep it up! Thank you so much, Ana Luisa! I really appreciate your comment and thoughts – it gives me even more strength to continue! I know you are doing amazing things with your students and that is something to admire – you are a wonderful educator. I am very fortunate to have connected with you on Twitter! Vicky, your Greek-Canadian friend in Switzerland! ありがとうございます, ευχαριστώ πολύ, merci beaucoup, and thank you for a sincere and thought provoking post. 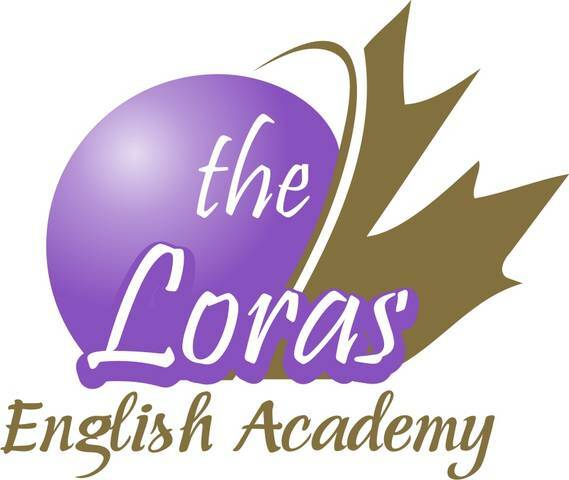 After reading your story I came back to the Loras English Academy logo. I saw that our beautiful national symbol, the maple leaf was included, and the maple leaf was olive coloured. I wonder if that was to symbolise the Greek Canadians that you and your sisters are – your parents too, if they became Canadian citizens while they were in Canada. Or perhaps my eyes are playing tricks on me and the maple leaf is meant to be gold 😉 The point is that your story got me thinking about multiculturalism. It’s something that Canada is the world leader in, I think. I guess it’d be unCanadian to boast about that, but I hear people in Australia and the U.K. describe their countries as multicultural and I think, hmmmm….no, not yet. Amazingly, I’ve heard America described as multicultural recently too, rather than the traditional “melting pot”. Multiculturalism isn’t simple and it’s not easy. Your story really makes that clear to me. You said “The truth is, I love Greece as my parents’ homeland, but apart from my work, nothing else kept me there”. Your first thought was to return to the land of your birth, which says that you love Canada too, and perhaps you love Canada as YOUR homeland. In the end you chose Switzerland because you wanted to remain with your family. The Loras Academy of English was a family business. Your loyalty lies with your family. That is your paradise. And within that paradise, there are individuals. I imagine that if your family sits round the television watching international sport there are many different flags waving in the room, a Canadian flag, a Greek flag, a Swiss flag… many flags but one family. Yes, thank you for inspiring me to think deeply about this thing we call multiculturalism. I wish I could say that I’ve made complete sense of it now, that the answer came to me like “a rush of blood to the head”, but it hasn’t. Probably never will, but the quest for the answer will sustain me. Michael, what can I say about your beautiful comment apart from “thank you” a million times! My family is my paradise. I am very fortunate to always have their support and love, and I support and love them very much as well. It is exactly the way you described it! For instance, when we are watching a sporting event and it happens that Canada is playing against Greece, we are completely torn ; ) Now Switzerland has come into the picture as well – huge Federer and Swiss football team supporter over here : ))) Three countries I love for different reasons. The logo was the inspiration of my oldest sister and a fantastic graphic designer who put Gina’s creative thoughts into the logo – she went to this professional, with the colours in mind (purple and gold, just because we all liked the combination) and the images – they came up with this beautiful logo and Christine (my youngest sister) and I absolutely loved it and then we kept it and used it everywhere! Thank you so much for your beautiful comment, Michael! Vicky, this is such a lovely story. We never know where life is going to take us, but in a lot of ways we make our own luck wherever we are. For one, I am very happy you moved here to Switzerland and that I have had the chance to get to know you. What an amazing personal story you have shared. How brave you were to face the new challenges that lay ahead of you when you gave up something that you loved so deeply and passionately. I am so happy that you now feel fulfilled in your new life in Switzerland. You have described your feelings so well, and I can understand what you went through perfectly as I have been in a similar situation, leaving family, job, uprooting lifestyle completely. All I can say is, that everything falls into place as a natural consequence of life. When one door closes, another one will invariably open. That new open door often leads to unexpected and amazing experiences, which would not have been possible if you had not ventured beyond your comfort zone. Thank you so much for sharing this heartfelt story of change and new beginnings. Thank you so much for your lovely comment and for sharing your story as well – I absolutely love what you say about things falling into place and venturing beyond comfort zones (something I had never done before, apart from going away to university). A very touching post, Vicky! Thank you for sharing with us part of your thoughts and life! It is always soothing to come to terms with your past so as to be well prepared for the future! I am sure the earthly paradise you are looking for awaits you- the best life has to offer is yet to come! I’m sure that your initial discomfort arriving in Greece strikes a chord with many of us, who have ended up in a different country to the one we first knew. Yes it’s hard changing countries, but when you get over those first years, in the end there are so many advantages, which one just couldn’t imagine at first, as your story shows. I am so fortunate I have met you all – and so happy! Yay for Paris! Can’t wait to see you again. Oh Vicky, thank you for sharing the story with us. I know from firsthand experience how difficult it is to move to another country and you went through it twice! But a talented and devoted teacher always finds her place! So glad to hear that despite the sad closing of your old school you like it in Switzerland! Reading stories like yours helps remind us that the old saying is true – when one door closes another opens. You just have to find that door! I could never believe the saying with one door closing and another opening – but now I have seen it happens for real! I’m so glad that you revealed a brief look into your school. Thank you! I’m sure with such a labour of love that closing it came as no easy or quick decision. I’ve often thought about going in that direction myself, but having had a taste into the business aspect of academics, I’m not confident I’d be able to balance it with all the good. I wonder though, did you consider trying to hire an outsider to fill your sister’s role? Also, would you like to do it again? Thank y o u for inspiring me and motivating me to write it – I had been avoiding talking about it, or writing about it, for that matter. I am sure you would be great if you ventured something like that, I really mean it. It is a lot of work, a big emotional thing as well, but all worth it in the end. The experiences I got out of this school, the things I learned, the people I interacted with, the relationships I have created through it have formed me to a great extent as a person and as an educator. In addition, the emotional rollercoaster of closing it down a n d trying to get used to living in another country have changed me a lot – I have seen what I can do outside my comfort zone. As to your question why we did not have an outsider come into the picture, that was for many reasons. Eugenia was an integral part of the school, the person who came up with the idea and helped it run so smoothly. Not because she is my sister, but her managerial skills are something else. We did not want to risk anything. We thought of everything before we took the final decision. What a lovely and very moving story, Vicky. I’m sorry that you’ve had such difficult times, but it’s heartwarming to read that in each new situation you are able to do so well. Wishing you lots of happiness in the future! Sending a big hug from Scotland. Thank you so so much, Carol! Something that helped me tremendously were all of you, all of the great contacts I made on Twitter – my motivation did not falter, I started my blog and did not give up : ) And I thank you for your great support and all the kind things you say which have helped me so much! You are one of the most positive presences on Twitter and I cannot wait to meet you in November! Thank you for sharing this story, Vicky, sorry for not getting here earlier, had a couple of blog posts to sort out 😉 Am really pleased you’re happy in Switzerland, and that you believe you’ve made the right decision. I’d wondered about your school and why you left Greece. What have you learned from running it? When you teach business English, do you feel you could do the same again?? No worries – thank you for dropping by : ) Thanks very much for all your support, it means a lot to me. I have learned so many things from running it – business-wise, working with other people and combining different personalities and talents – lots and lots of things. Marijana, thank you so much! I am speechless, thank you so very much, what an honour : ) The fact that you read it and liked it makes me very happy – please don’t worry about updating your nomination! Only the fact that you said it and thought of it makes me very happy! Just reread this. Tough, tough, tough, but it seems like the transition has been a good one ! Thanks for inspiring us all, Vicky ! It has been a great experience so far : ) Thanks so much to you for writing your story and for sharing all your wonderful experiences and photos! Thank you so so much with all our heart for your lovely comment – I love what you say that if something goes wrong, something better is on the way : ) We send you and your sister best wishes and I can’t wait to meet you in Istanbul! Can’t wait to meet you too! Warm regards from all Queen English Language School teachers!